You don’t have to be a minimalist to appreciate the benefits of a less-cluttered home. Americans are in love with their stuff — and it isn’t a healthy affair. The average person has 23 unnecessary items in their home, according to a study by ClosetMaid, and 47 percent of respondents suffer from clutter-related anxiety, making it difficult for them to feel relaxed at home. You don’t have to be a minimalist to appreciate the benefits of downsizing. Whether you’re moving to a smaller space (welcome to Seattle! 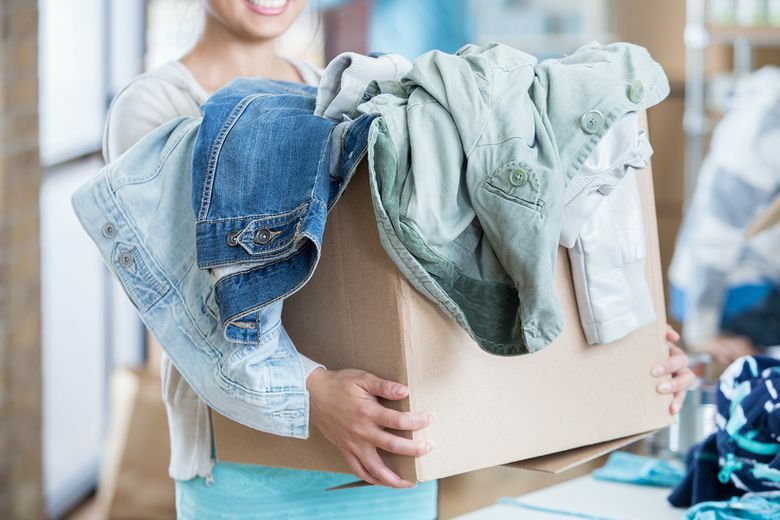 ), slashing your household budget, or simply trying to streamline your life, here are a few ways to begin and make the most of the downsizing process. Would I replace it? There are certain things you probably love, use regularly and would miss if they went away. Irreplaceable items belong in the “take” pile. Have I used it in the last 12 months? This question is usually reserved for a pair of pants from 2008 or a juicer you bought for an ill-fated cleanse. Unused items equal clutter. Move these neglected pieces into the “toss” pile. Does it have long-term value? Some things don’t fit in your life at the moment, but that doesn’t mean they won’t in the future. Family heirlooms, overstuffed photo albums, childhood artwork, etc., carry intrinsic value, and it’s okay to hold onto them elsewhere. Yelp’s list of 10 best self-storage units in Seattle provides some good options. Look for duplicates. Living with too much stuff usually means overlooking repeat purchases. For instance, how many hair dryers do you own? What about old electronics like laptops and cellphones? As you’re sifting, take stock of the duplicates in your home to determine what you can reasonably part with if you have a newer, working model of the same item. In the case of electronics, Washington’s E-Cycle program allows residents to recycle their laptops, monitors, computers, and TVs for free. Check out their website for participating facilities in your neighborhood. Prioritize quality. Downsizing doesn’t necessarily mean skimping on quality. In fact, buying higher quality, longer lasting products can help you buy less over time. When it comes to clothing, a 2015 survey commissioned by the British charity Barnado’s revealed that the average women’s garment was worn just seven times before being thrown out. And Huffington Post reports the average American discards 81 pounds of clothing each year. Buying quality items in clothing, décor, appliances, and other household necessities means that your possessions will last longer, and the slow-creeping clutter won’t return. Consider reworking your budget to prioritize quality over quantity when it comes to shopping. Set an earnings goal. Speaking of budgeting, downsizing presents the perfect opportunity to earn some extra cash. While some of the items in the “toss” pile are likely destined for the trash or donation (you’ll find a list of Goodwill centers here), others might have significant value. For clothing and other wearables, take advantage of local resale shops like Buffalo Exchange and the PoshMark. For furniture, tech, and everything in between, online options like Facebook Marketplace and the LetGo app are worthwhile options. Set an earnings goal during the decluttering process; $250 or $500, for example. Attaching a monetary value to your efforts can make things fun and help you move more quickly. This is also a good time to take a new inventory of your belongings and speak with your home or renters insurance company to see if any adjustments should be made to your policy. Rely on a professional. You’re not alone if downsizing feels easier said than done. A significant lifestyle change can be tough, especially if you’re having trouble assigning value to your things. The good news is that you don’t have to take a solo approach. There are dozens of experts — known as professional organizers — available in Seattle and the neighboring suburbs. Seek help if you can’t make sense of the clutter. A fresh perspective could make all the difference. Visit WelcometoAmicaHome.com to discover information on home maintenance and insurance, how to protect your home and belongings, helpful articles, checklists, infographics and more.